The major lesson from the Fukushima nuclear disaster is that for emergency management, preparedness by learning the past lessons is the key for public safety and disaster mitigation. Fukushima nuclear disaster is one of three disasters of the Great East Japan Earthquake which erupted March 11, 2011. It was a man-made disaster caused by the negligence to the safety preparedness. Government nuclear safety regulators, and nuclear power station (NPS) company, TEPCO did not install necessary safety mechanisms, ignoring the previous lessons available from the Three Mile Island, Chernobyl and many past NPS accidents in Japan. Three and half years have passed, but the Fukushima disaster, despite the stabilization efforts, is far from over with continuous radiation and leakage of radioactive contaminated water. In September 2013, government overtook the major recovery responsibility from TEPCO‘s liability for stopping the contaminated water leak, facilitating the debris cleaning/storage and decommissioning the damaged NPS. While the government had not yet shown a valid scenario to end the disaster, it announced in April 2014 that the NPS would resume operations as soon as the newly established Nuclear Safety Authority completed safety reassessments. Did Japan really learn the lessons from the Fukushima? Majority of the citizens, shocked by the huge Fukushima accident (INES 7-equivalent to Chernobyl), lost their trust in government that hitherto had advised safety of the NPS and are against the resumption of NPS. Moreover, the government has not disclosed the damage scales, or risks involved in the Fukushima nuclear disaster, while stressing the necessity of NPS as ‘base load’ electricity energy. However, released government data, and occasional big media disclosed estimates, roughly explain a whole picture of the Fukushima nuclear disaster. There are still around 130,000 government-led evacuees. There were no immediate direct deaths but government certified 1,704 indirect deaths. 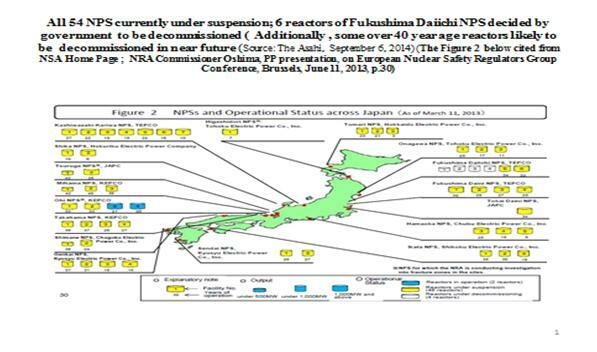 All NPS in Japan were suspended for reassessment of their safety (54 before the disaster; see the figure below). Compensation to afflicted residents paid so far equals 5.1 trillion yen. The cleaning cost of radio-contaminated soils by the government is estimated between 5-9 trillion yen. Decommissioning of the damaged NPS is estimated estimate around 15 trillion yen or approximately US $150 billion. These cost are mostly to be covered by tax and users; 1.1 trillion yen construction cost of midterm debris storage in Fukushima. These 3.11 Fukushima NPS accident caused damages may be compared with those of the 3.11 earthquake (Magnitude 9) and huge tsunami disasters that resulted about 20,000 deaths; and initial five year recovery cost (excluding the Fukushima nuclear disaster) by government around 25 trillion yen (appr.US $250 billion). Citizens now pay reconstruction income tax for 25 years. NPS use was promoted in Japan as electricity sources for national economic development since 1956. It was facilitated after world oil shock crisis and environment pollution problems in 1970s, aiming 50 percent level of entire electricity. According to the reports of the parliamentary, governmental, and professional Fukushima nuclear accident investigation groups, (NAIIC, 2012; GIC, 2012; Rebuild Japan Initiative Foundation, 2012), for NPS promotion, systematic collusion continued for long among i) safety regulators and NPS promoters in government, ii) private industry NPS operators such as TEPCO, and iii) nuclear scientists. Such collusive practice, producing “Safety Myth” of NPS, rejected any criticism on safety within this “Nuclear Safety Village.” These circumstances disabled to consider possible severe NPS accidents in emergency management services and led to gross negligence to emergency preparedness. In Japan, local municipal governments take primary responsibility by law in disaster emergency management, including directing the evacuation. Even they were not given at these disasters, necessary information on radiation spread direction, although available from the beginning in the central government monitoring system. The parliamentary investigation NAIIC found that government had not even kept the nuclear emergency management records. Recently, the media leaked the government investigation committee’s hearing transcripts of the directly involved NPS director and government emergency managers, contained the details of what happened in the damaged Fukushima NPS. The media asserted that these leaked transcripts included important information useful for the preparation of safer emergency management services and demonstrated that at a severe nuclear accident it was difficult to grasp precise accident information at the life-threatening situation. Government has not yet released these transcripts, although now pressured to do. At emergency, public services may not be available instantly. Both citizens for self-help, and municipal government for emergency management, should therefore be equipped with knowledge of step- by- step escape actions. Drills for evacuation for emergency managers and citizens need to be organized. Japanese citizens gradually learned that no practical NPS decommissioning technology is available, no final destination of storage nor technologies of radioactive nuclear wastes found anywhere in the world and current NPS technologies are not safe. Nuclear-based electricity is not cheaper or cleaner than other energy based electricity and yet NPS use is currently promoted worldwide. With or without the resumption of stopped NPS in Japan, radiation spread and risks of accidents still exist. Central government needs to support vigorously the local municipal emergency services for public safety and disaster mitigation by sharing the transparent nuclear risk, crisis information and management records now acquired from the Fukushima lessons. IAEA alerts the importance of better communication on radiation risks and protection by the government and IAEA to all the disaster stakeholders, including emergency managers and the citizens. (IAEA Conference report on Promoting Confidence and Understanding, Feb. 21, 2014). Transparent government risk and crisis communication is essential for preparing emergency management for public safety.